Food trucks for people have grown increasingly popular and serve everything from hot dogs to exotic delicacies. Thus far, food trucks for pets are less common, but this might change in the future. 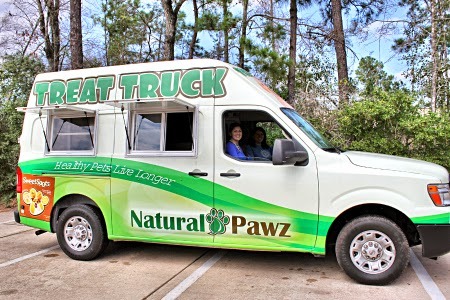 Earlier this year, Natural Pawz in Houston debuted their Pawz Treat Truck. The dog treat truck offers treats, bones, ice cream, and other doggy snacks. Natural Pawz is Houston's largest locally owned natural pet supply store, and besides the food truck being a great promotional tool, they donate a portion of the proceeds to Houston Humane Society. The truck has been rolling around the city since March, and will continue to visit dog parks, festivals, charity events, and similar through the rest of the year. What do you think of the idea? Does your area have something similar? I would love to see that truck in my area!